Marcie's Pet Spa Grooming School is a different kind of "school." We want to teach you how to groom, yes, but we will also teach you the life skills you will need to become a successful groomer. This means teaching you not only the skills it takes to groom a dog that will look good and feel great, but how to build relationships with your clients that are meaningful and lasting. 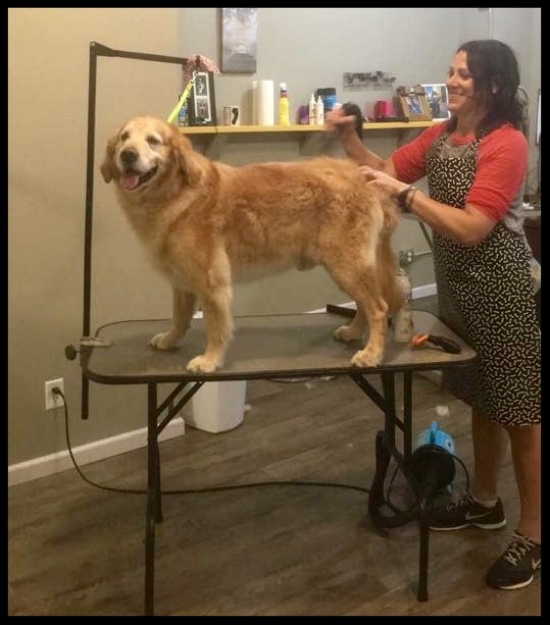 Your instructor, Marcie Culver, has over ten years of grooming experience, and has built a successful Pet Spa that has grown to 2 locations over the past eight years. You will spend three months learning the basics of dog handling, grooming skills, and how to build relationships with both dogs and people. Also, and most importantly, you will have FUN while learning. Your 3 month grooming school course will take place Tuesdays, Wednesdays, and Thursdays at the Marcie's Pet Spa Ripon location. We will provide you with all the equipment you need! The cost for school is $7,000 and includes the guarantee that you will be able to groom on your own when you complete the course. For more information on attending grooming school, contact Tina Wehrs at 608-612-0266 or tina@marciespetspa.com .